Rutkovych, Ivan [Руткович, Іван; Rutkovyč] was born in Bily Kamin, near Zolochiv, Galicia, but where and when he died is unknown. Icon painter of the 17th century. Most of his creative life was spent in Zhovkva (1667 to ca 1708) where, among other things, he was one of the key figures in the Zhovkva School of Artists. Some of his work has been preserved, in whole or in part, such as the iconostases of the wooden churches in Volytsia Derevlianska (1680–2) and Volia Vysotska (1688–9); the large iconostasis of the Church of Christ's Nativity in Zhovkva (1697–9, now in the National Museum in Lviv), which is considered to be the finest Ukrainian iconostasis; and separate icons, such as Supplication (1683) from Potylych (now in the National Museum) and The Nativity of Virgin Mary (1683) from Vyzhliv. Rutkovych's treatment of religious subjects was realistic and almost secular in spirit. The emotive richness of his colors and the rhythm of his lines testify to the influence of contemporary European art on his style. Vira Svientsitska's book about Rutkovych was published in Kyiv in 1966. Master aso worked for the royal residence that during the rule of the Jan III Sobieski contained in Zhovkva in the royal castle-palace. Working in the castle (just the name John Rutkovych was mentioned in the accounts of the royal chancellery in restoration work, copying paintings, gilding and other finishing works), he was able to benefit from the rich collection of paintings of King and learn canvases of European artists. And, unfortunately, this page of the master remains virtually unknown. Ivan Rutkovych (Ukrainian: Іван Руткович), born about 1650`s. in Bilyi Kamin, near Zolochiv, Ukraine, died after 1708, was a Ukrainian icon painter who worked mostly in Zhovkva and Univ. He is considered a founder of Zhovkva Iconographic School of painting and wood carving. Some of Rutkovych's work was lost, but there is still a significant amount of well-preserved icons, as well as iconostases, made by Rutkovych together with other masters. There are iconostases of the wooden churches in Volytsia Derevlianska (1680–82), Volia Vysotska (1688–89); the large (10,85 х 11,87 m) iconostasis of the Church of Christ`s Nativity in Zhovkva (also known as iconostasis from Nova Skvariava) (1697–99), now in Lviv National Museum. 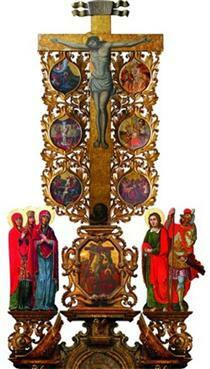 The last is considered as a masterpiece among Ukrainian iconostases of that time. It consists from 7 rows of icons. It was restored and exhibited to the public in 2009. Also in Lviv National Museum are preserved separate icons, among them Supplication (1683) from Potelych village, Lviv region. The artistic style of Ivan Rutkovych combines Ukrainian-Byzantine tradition of expressing religious subjects with modern European influences, more secular and realistic. Rutkovych is a most prominent representative of Zhovkva Iconographic School of painting and wood carving. According to art historians, in that time new iconographical cannons were established, giving free rein to the artist to reveal his individual style with maximum care for detail. A score of local schools sprang up in Sudova Vyshnia, Zhovkva, Robotychi, Volyn region and other. The iconostasis of The Holy Trinity Church in Zhovkva shows contribution of different masters, among them Vasyl Petranovych (icon of Savoir, icon of Our Lady), Hnat Stobensky (carving of the Holy Door) and Ivan Rutkovych himself (Annunciation, Christmas, Archangel Michael). The Church is placed on the UNESCO World Heritage List since 2013. In Lviv, there is the street named after Ivan Rutkovych.